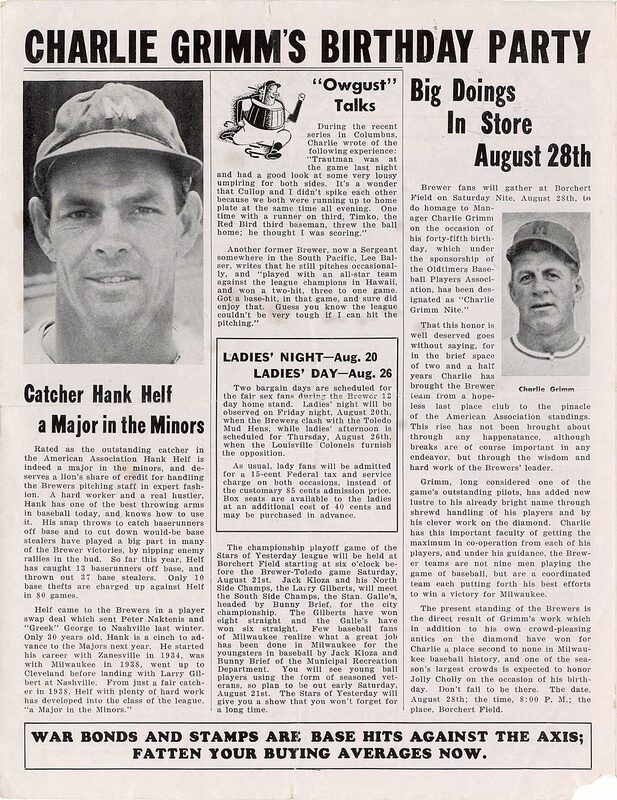 Today's installment in our ongoing look at Brewer News, the club newsletter published throughout the year to keep fans appraised of the latest news and upcoming events, takes us to August 16th, 1943. This copy is a bit rough, but it's autographed. 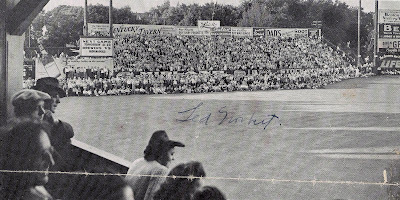 I imagine a kid standing along the Borchert Field wall waiting to snag his favorite players' scrawls. 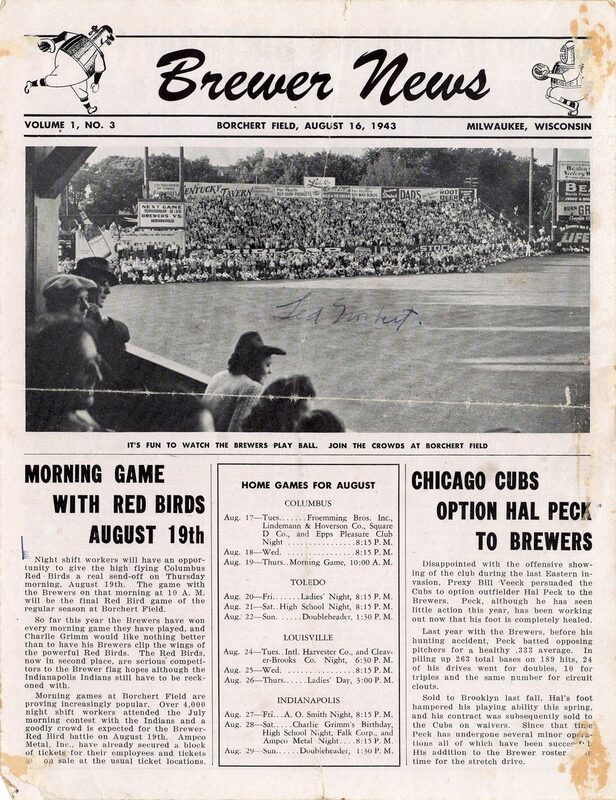 The cover here has been signed by new Brewer slugger Ted Norbert. 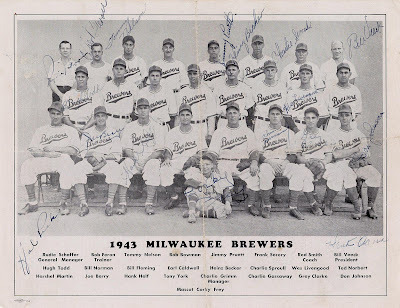 Norbert came to the Brewers in 1943 from the Pacific Coast League. 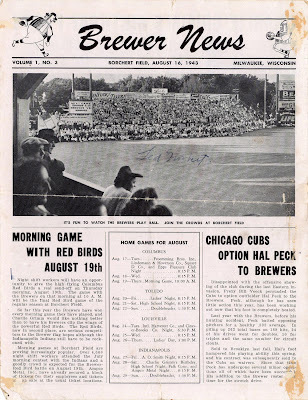 I'm amazed by that photo - look at all the fans sitting on the warning track! 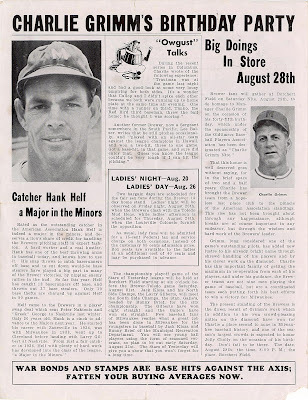 "Big Doings" indeed; the pre-game birthday party turned out to be one to remember. 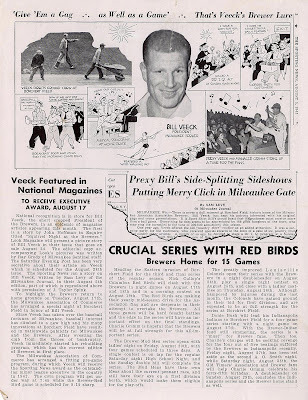 In addition to a war bond, new banjo and other presents, Bill Veeck gave Jolly Cholly a new pitcher; Cuban-born Julio Acosta was wheeled out in a 15-foot cardboard "cake". 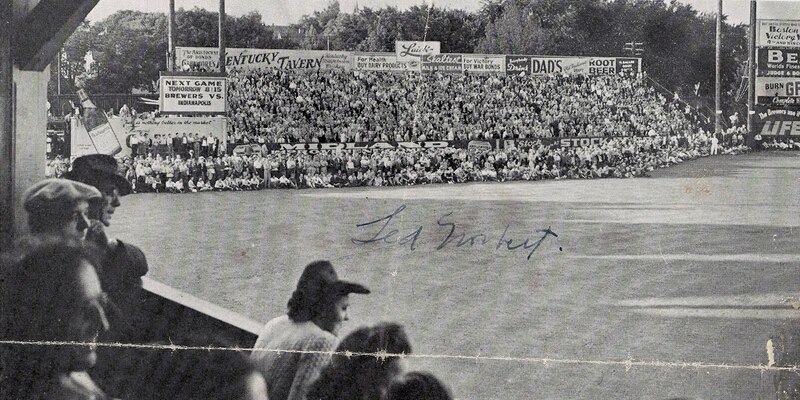 In the spirit of the day, Grimm started the left-hander in the game just moments later. Acosta lost that game, but he did win his next three decisions to end the season. 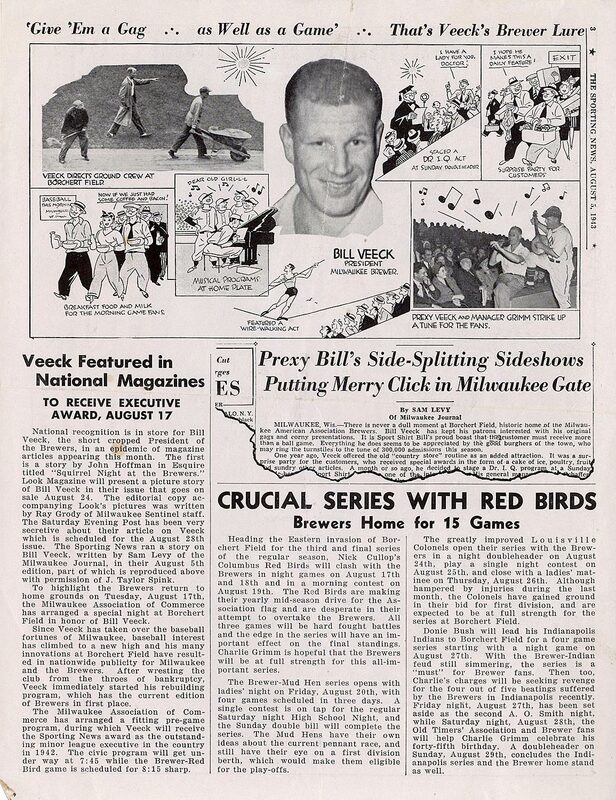 The following page highlights some of the press Veeck had been getting around the country, including a fantastic write-up in the Sporting News. 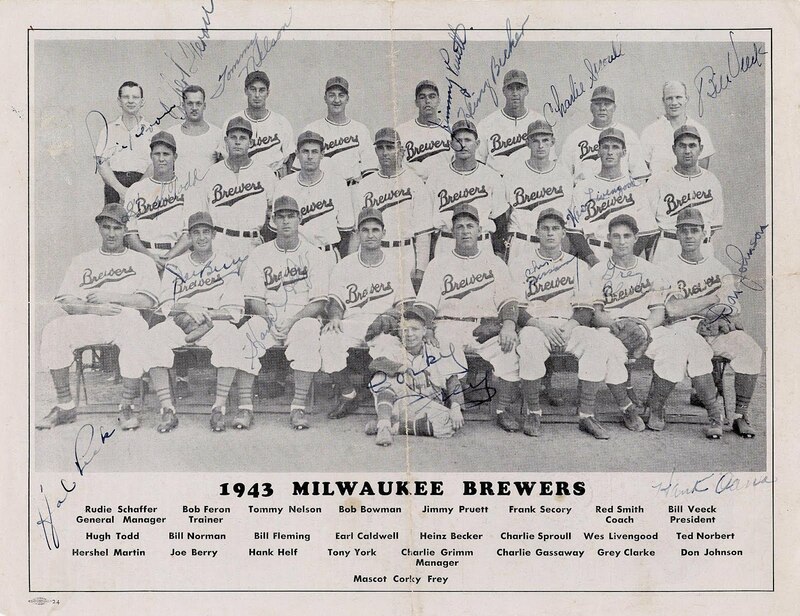 The real treasure is the back cover - a team photo of your 1943 Milwaukee Brewers, signed by 16 members of the organization including Veeck and general manager Rudie Schaffer.